It is becoming more and more evident that the coming Nokia World event will be the venue of the unveiling of the latest range of Nokia’s Windows Phone 8 smartphones. Perhaps rather embarassingly, besides the more traditional cryptic invites, Nokia has probably gone one step too far into overconfidence in WP8. 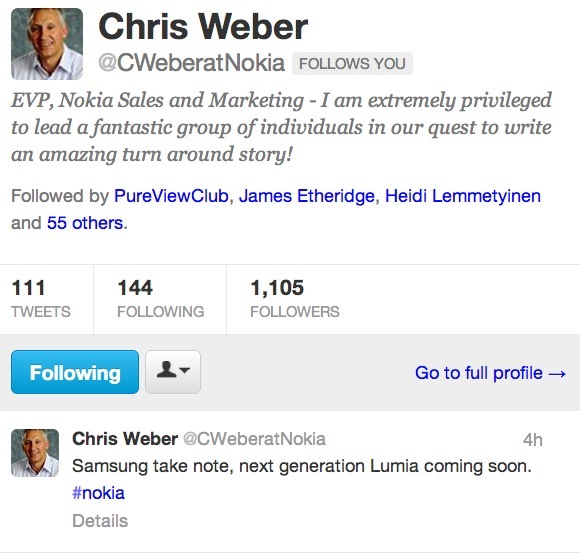 Nokia’s new EVP of Sales and Marketing, Chris Weber (who, prior to this has no experience whatsoever in the sales division of smart devices) boldly tweeted the above tweet. Make what you will of the “Samsung” and “note” in the tweet, but many might just be turned off by the rather tactless tweet, as companies rarely name each other in the open.